More lazy lawn care tips: Mulch ado about … almost nothing! Here’s a way to save your back and be kinder to the planet: Leave your leaves alone. Instead of raking, one of the newest lawn care trends is to mulch leaves in place. The decomposing fragments will nourish your lawn over the winter, giving you a greener yard in the spring. Tired of raking? Leaf mulching is a great alternative that will benefit your lawn. Just imagine: All that twisting, bending and bagging can be history! Think of all the extra time you’ll have! All you need is a mower that has a mulching feature, preferably one with a side-discharge that will neatly deposit the mulch as you go. Mulching mowers with side discharges can even move easily through wet leaves sitting on top of tall, moist grass. The side-discharge is also efficient. Whether you mow in stripes or concentric circles, you’ll be re-cutting the mulch discharged from your previous pass, making it even smaller. Reducing your carbon footprint. There will be fewer bags of leaves to transport to landfills. Or, if you’re in the habit of burning leaves, you’re reducing air pollution. Doing your part to prevent flooding. Your leaves won’t be flying into the gutters, wreaking havoc by clogging the city’s drainage system. Feeding the earthworms. The decomposed leaves give beneficial insects, earthworms and microbes something to munch on over the winter. Earthworms improve soil aeration and help prevent erosion. Soil microbes promote turf growth and help to crowd out disease-causing pests. Reducing your irrigation needs. Mulched leaves help to improve your lawn’s ability to soak up rainwater. Cutting back on the need to add fertilizer and weed killer. As those confetti-sized leaf fragments decay, they feed the soil and act as weed control agents. 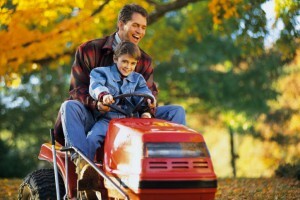 Using the the right lawnmower will make leaf mulching a breeze! The best time to mulch is when you can still see some grass poking through the leaves. Don’t wait until the leaf piles are so thick that you’re struggling to push the mower. That’s too much work! The mulched leaves will be completely absorbed by spring. But if you have extra mulch, spread it into your garden beds for healthier plants, flowers and vegetables. Leaves are a natural resource. Mulching is a simple way to recycle and use them to your advantage.